First recorded by Little Stevie Wonder (1962). Hit version by The Blendells (US #62 1964). From the wiki: “The Blendells were a 1960s Mexican American brown-eyed soul group from East Los Angeles, California. They garnered success in 1964 with their Latin-tinged cover of Little Stevie Wonder’s ‘La La La La La’, written by Clarence Paul and first released on Wonder’s 1962 chart-topping album Recorded Live: The 12 Year Old Genius. The Blendell’s 1964 recording peaked at #62 on the national charts, but it was #1 in Phoenix, AZ (where they performed as headliners before 11,000 people), Hawaii, and Los Angeles, at a time when the #2 song was by The Beatles. “The song was brought to the attention of the band by drummer Ronnie Chipres. The Blendells were playing it at one of their gigs when Eddie Davis heard it and urged them to record it. Lead singer Sal Murillo says the song was recorded in one take. Many in the ‘West Coast East Side’ music community believe The Blendells would have achieved far more success had most of its members not been drafted into the Vietnam War. First recorded by Chris Clark (1966). Hit version by Stevie Wonder (1967 |US #7/R&B #5/UK #2 1969). 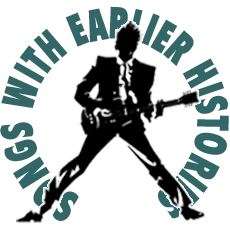 From the wiki: “‘Yester-Me, Yester-You, Yesterday’ was written by Ron Miller and Bryan Wells and was first recorded, in 1966, by blue-eyed Soul singer and Motown recording artist Chris Clark. Clark became famous in England as the ‘white Negress’ (a nickname meant as a compliment) because the six-foot platinum blonde toured with fellow Motown artists who were predominantly black. America’s answer to Dustry Springfield, Clark managed to have only one chart hit in the US: ‘Love’s Gone Bad’ peaked at #105 on the Billboard’s Bubbling Under the Hot 100 chart and #41 R&B in 1966. Clark co-wrote the screenplay for the 1972 Diana Ross vehicle Lady Sings the Blues, for which Clark was nominated for an Academy Award. Clark later became an executive for Motown Productions’ film and television division in Los Angeles.